Nearly everyone who owns a collectable or classic car that sits for weeks/months between drives has this problem: you have to crank and crank the engine before the mechanical fuel pump gets gas to the carburetor. Sometimes this can lead to overheating of the starter motor and battery rundown. It's not the best of situations, to say the least. Another problem is fuel pump failure. Mechanical fuel pumps have diaphragms that can leak or fail outright, leaving the vehicle stranded unless a spare pump (or rebuilding kit) is handy. This too is a bad situation. We've come up with a dandy fix for both problems. We've installed universal electric fuel pumps in parallel with the stock mechanical pumps in all our vehicles. These pumps sell for about $25-$30 and can be mounted practically anywhere in the engine bay. Fittings ("T") and hose clamps are quite inexpensive and available anywhere too. All that's needed in addition to these are some fuel hose and a toggle switch and wire. T-fittings let us run our electric and mechanical fuel pumps in parallel. Here's what you need to do. Because most fuel pumps have one-way valves that prevent drawing fuel in from above, a "T" fitting must be installed in the fuel line that leads to the mechanical pump inlet. 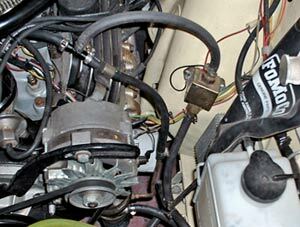 This fitting will feed the auxiliary electric pump through a piece of fuel hose. Fuel hose will also lead from the output of the electric pump to another "T" fitting installed in the fuel line to the carburetor. The photo below shows the arrangement in one of the cars. We installed toggle switches on/under the dashboards of our cars. These switches get power from any available voltage source and go to the electric pump input power lead. Whenever we "cold start" our cars we simply turn on the ignition and the electric pump, leaving it on long enough to get fuel to the carburetor. Once we know fuel is present we turn it off, set the choke and start right up, avoiding the endless cranking. The engine then runs on its mechanical pump. In the event of a mechanical pump failure during a drive the electric pump is already in place and "plumbed" for action. Simply turn it on and away you go! There you have it. Two major problems are solved with one accessory.